We rencently went out and played Beachwood and we had a great time. I wasn't hitting the ball off the tee box as well as I would have liked but the wide, forgiving fairways helped me out quite a bit. The bermuda greens were in great shape, but slightly slow for my taste (considering we had pretty heavy rain the night before) so I was having to take a more aggressive approach on the putting surface. Green and cart fees were very reasonable - we arent' in the middle of golf season so that helps! My favorite hole on this golf course was the 195 yard daunting Par 3 finishing hole over water. We stopped by the grill in between the front and back nine to grab a couple of snacks and the staff are very accommodating and friendly. Grabbed our food and drinks and we were back on the course in no time. On our way out we checked out the nicely stocked pro shop and looked at the various clothing for purchase. Great selection and reasonable prices, too. 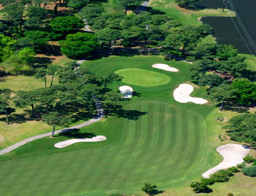 We really enjoyed the traditional layout of this golf course and we will definitely be playing it again soon. Check out their website to get further information! We rencently went out and played Beachwood and we had a great time.